With the world becoming smaller and more content-driven in this information age, video content and visual data form the major chunk of information that is shared and presented – whether it is a simple PowerPoint presentation in a conference room or city surveillance video viewed at a central command & control center or a video feed from remote off-grid locations anywhere in the world. This enablement of consumption of visual data depends a lot on critical video production and distribution systems to work in real-time. Big corporations, news channels, security and traffic authorities depend on control room display to monitor, recognise and identify the problem and arriving at the quick resolution the minimise the impact caused due to problem. SSS provides the latest technology based and wide range of options for projectors and control room displays. Whether you need a wall mounted, ceiling mounted, ceiling recessed, tab-tensioned or non-tab tensioned projector screen, we have the right screen for your application. Combine the perfect screen with the perfect control option and you have a quality product that delivers quality and performance. We offer our widest ever selection of proprietary projection screen fabrics and materials. 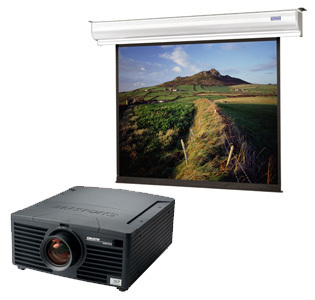 Whether you need a projection screen for a corporate boardroom or a residential media room, you will find what you are looking for from our wide range of products. We offer the broadest range of LCD, 1-chip and 3-chip DLP projectors on the market. No matter your budget or application, we have what you need. Whatever your vision might be, from a meeting room to the most sophisticated live event, no venue is too large or too small for a digital projector. We offer broadest range of projectors and integrated display systems for every budget and application – Company boardrooms, Conference Hall, Multipurpose halls, classroom, lecture hall, training room, meeting space or stadium. We can help you choose the solution that’s right for you. Our projectors have the features and functionality your organization or college needs to display any idea anywhere with ease, clarity and impact. Edge blending is two projectors as one continuous screen. From small- and medium-sized businesses to the largest enterprises, high definition video conferencing will bring people together simply and conveniently for more effective collaboration and greater connection to the information they need to succeed. The result? More streamlined operations and improved productivity for every member of your company—down the hall or across the country. Our video conferencing solutions can match your company’s business needs, by industry, line of business or location—and how you can deploy solutions to best fit with the way you use technology.